We witnessed some of the most beautiful sunsets, while vacationing in San Diego, last month. 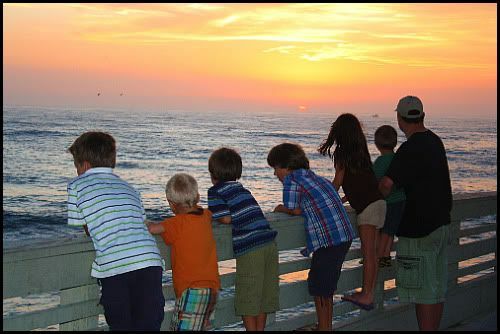 This picture was taken on the pier in Ocean Beach – A rare and golden moment of silence, inspired by awe. So lovely Christine..Not one child moving.. This picture is gorgeous! You need to enlarge and frame this one Christine! Oh how gorgeous, Christine! And such a beautiful photo of your family too, I love it!! Love San Dog – I bet you had an awesome time. What a wonderful photo! Definitely frame-worthy! Sunsets on the beach are so wonderful, glad you got to enjoy one!